The Casio Fx7000g is the first graphic scientific calculator in the world. Well, apart from being the first ever graphic calculator, it's just a natural evolution of the Casio FX programmable calculators family, so no other features stands out. The graphic part, however, was impressive enough at the time, even if a huge graphic screen is now considered "normal" for a scientific calculator. I haven't noticed any difference between the machines, apart from the reference. Casio is a manufacturer i like a lot because of the innovation it was capable of. 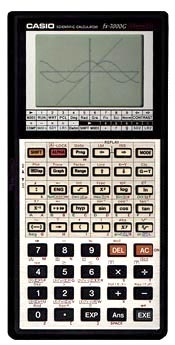 The Fx-7000g illustrates this by being the first graphing scientific calculator in the history.